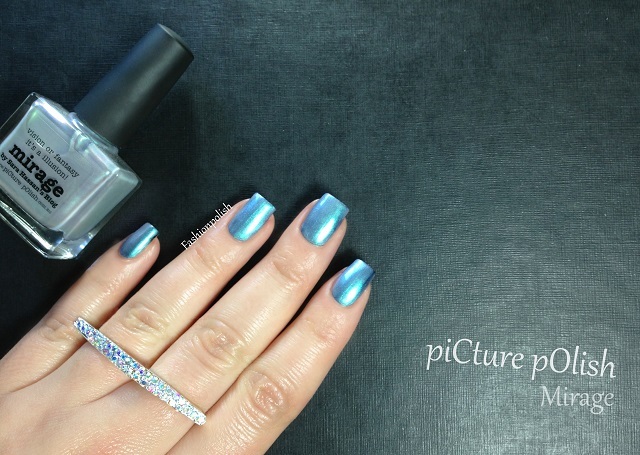 Fashion Polish: piCture pOlish Mirage review! Today's post features my weekly piCture pOlish post and a very unusual shade : Mirage. Mirage is a very complex shimmer that gleams shades of grey, blue, green and purple. It's a true chameleon that will look completely different depending on your lighting. Very pigmented, it'd reach full opacity in three coats but I decided to use it over black here to try and show you the color shift a bit better. I used one easy coat (over black) plus topcoat in these swatches. What do you think? Do you own Mirage? If so how do you wear it? piCture pOlish Mirage retails for AU$11.50 and can be purchased directly from piCture pOlish.com.au or through their international network. Wow you made this look so appealing, no one has enticed me to buy this...until now! Beautiful swatches!